34.5 x 29.7 cm. ; frame: 113.5 x 67.3 cm. In his memoirs, Horsley wrote of his new home, Willesley, in Cranbrook, "Then came the question of enlargement, and of beautifying the house, and this led to my putting the matter in the hands of Mr. Norman Shaw, then a rising young architect." 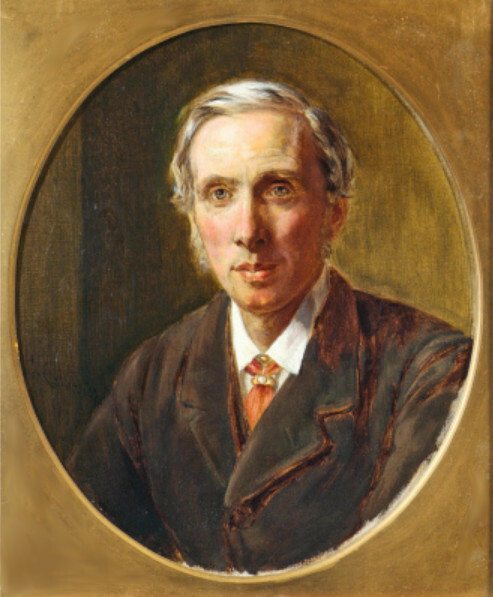 He continues, "Norman Shaw's fame is now world-wide, and so also is the knowledge of the debt that English domestic architecture owes to his genius and originality, so I need not dwell on the undoubted fact of how much our house owes to his inspiration" (340). Horsley, John Callcott. Recollections of a Royal Academician. London: John Murray, 1903. Internet Archive. Contributed by the University of California Libraries. Web. 19 April 2018. Valentine, Helen. "Horsley, John Callcott (1817–1903), painter." Oxford Dictionary of National Biography. Online ed. Web. 19 April 2018.